April 2012 – Amit Bahree's (useless?) insight! I am running Windows 8 on my primary work machine now, which is domain joined. When I try and use the SkyDrive metro app (which ships with Windows 8), it does not like that fact I am domain joined and wants me to switch accounts, which is something I don’t want to do. This of course works great for those who are not domain joined and essentially are personal machines. For many of us who will be using this on ‘work’ machines, this seems like we will be ignored. Of course I can install the desktop app, but that is not Metro and I am then in the ‘old’ world. Also the free 25 GB has now dropped to 7 GB, if you already have a Live account, I suggest you login and upgrade your account back to 25 GB for free! I had forgotten that I had the AWS Extension for Visual Studio installed until recently I noticed AWS Explorer item in the View menu option. This add-in allows you to explore the various features that Amazon exposes right from within Visual Studio. The toolkit makes it easier for developers to debug and deploy a .NET solutions that uses AWS. When you install this, you also get AWS SDK for .NET which provides one with all the building blocks that are required for consuming the IaaS services exposed by AWS including SimpleDB, S3 and EC2. 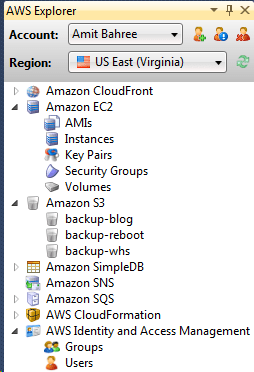 If you are or planning to use AWS, this add-in is a must have in my opinion.